Update: Chong will be broadcasting from the party live exclusively on the Allan Handelman Show. Listen here. Update: Chong was a no-show. Allan was unable to reach Chong via his cell. LA Weekly conducted a great interview with Tommy Chong at his Calfornia home. During the interview, they discuss his incarceration, Dennis Miller encouraging him to start doing stand-up again and the Cheech and Chong reunion. He said he and Cheech are looking to do a tour and write new music. While meeting with press at the HBO Comedy Festival in Aspen, Cheech Marin and Tommy Chong provided more details on their reunion film. Cheech says the script is nearly finished and they want to start filming right away. Both would like the film to be released this summer if possible. Also of interest is that New Line Cinema may not be distributing the movie after all. They would not elaborate. That leaves two questions unanswered...Who is the director? and Which film company will distribute the film? However, one thing is undeniable. The film is going to be great. Earlier today, they appeared on AMC's Peter Bart and Peter Gruber's Sunday Morning ShootoutÓ. They are just as funny now as they were 20 years ago. The Aspen Times (photo courtesy of Aspen Times) and Denver Post provide a recap of Thursday's "Together Again" reunion of Cheech Marin and Tommy Chong. It was the first time they were on stage together in 20 years. The event was hosted by rapper and host of MTV's "Pimp My Ride", Xzibit. The St Regis Ballroom was packed. It was standing room only. It began with a film retrospective and was followed by a Q & A session. Update: Cheech Marin and Tommy Chong also did some stand-up and played Up In Smoke live. 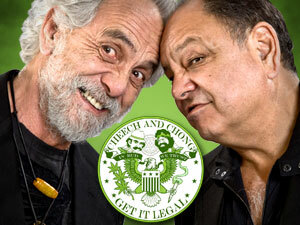 Cheech and Chong will be onstage tonight, together, for the first time in 20 years. The event takes place at the HBO Comedy Festival in Aspen, Colorado, followed by an appearance at 1 p.m. Feb. 11 at the Ballroom for a live taping of Peter Bart and Peter Gruber's Sunday Morning Shootout (Air Date: Sun 02.13.2005, 11AM ET/PT AMC). Today, National Public Radio conducted the most thorough interview we've heard with Tommy Chong since his release. Touring...Chong says he's only able to perform in Canada until his probation is over (this Spring). Arrest...He gave more details on his arrest. He says that undercover agents went to his son's bong factory and purchased $5,000 worth of bongs. These headshop owners/agents said they wanted to purchase even more bongs and asked Chong Glass to ship the bongs to the fake headshop. It was total entrapment. These agents had been trying to get Chong glass to ship bongs to Pennsylvania for months. They flew to the factory out of desperation. Chong received the harsh nine month sentence because Tommy told the press that the only weapons of mass destruction George Bush found were his bongs. They even mentioned what Chong said during his sentencing. Arnold Schwarzenegger...Tommy met Arnold at a gym and smoked pot with him shortly after Arnold came to the US. Arnold is in denial about it. The Denver Post sat down with Tommy Chong to discuss this Thursday's reunion in Aspen. It will be a tribute to Cheech and Chong which will include a Q & A session. During the interview, Tommy also mentions, that the reunion film is in the "rewrite-the-script stage." Tommy Chong will be on Dennis Miller this Wednesday, 02.02.2005. Dennis Miller airs weeknights at 9PM EST on CNBC. Update: During the interview, Dennis and Tommy briefly discussed C & C's Feb 10 Aspen reunion and said it will lead to future C & C endeavors...if Cheech can fit in the dresses. Chong also promoted THE MARIJUANA-LOGUES tour. Don't miss this tour. We've seen it and it's fantastic.